You’re about to embark on the first adventure in your new RV, and your feelings of excitement are through the roof. Though in the back of your mind you can feel just a little bit of anxiety and nerves, mainly because you’ve never pulled into a campground with your new rig, not to mention hooked it up to everything. Above is exactly how I felt before our first trip, I knew everything would work out but at the same time I had no idea what I was doing. 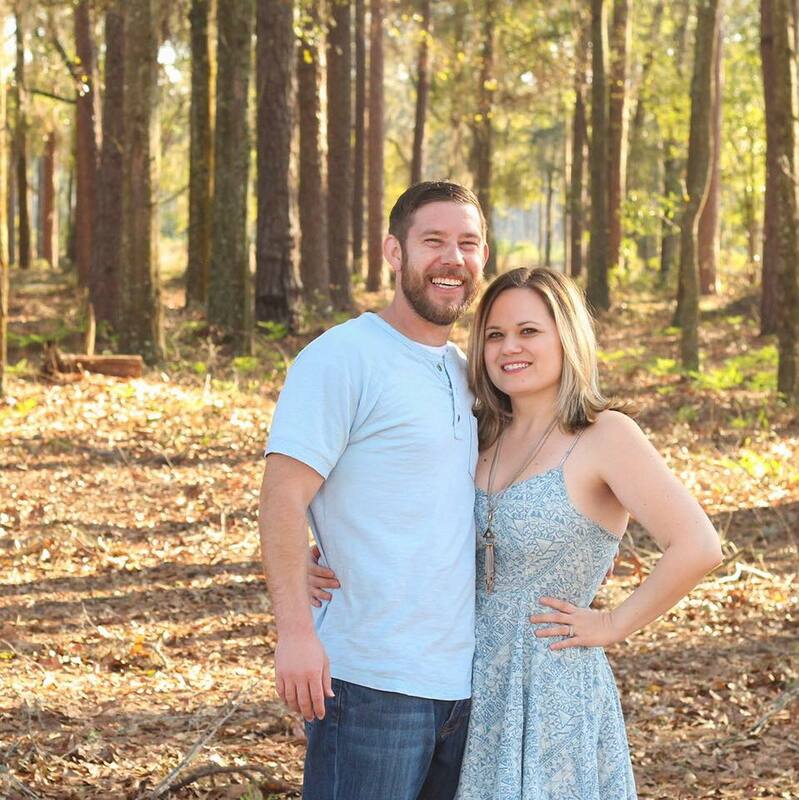 Rest easy, because below we’re going to discuss what you need to know before your first trip in regards to your RV hookups. Let me tell you from experience, it’s not going to be nearly as difficult as your mind would lead you to believe. The first thing I do when I pull into our new spot is make sure our RV is leveled out and secured. I also get the slide-outs pulled out, if you don’t have slide-outs no need to worry about this. Our slide-outs aren’t located near our hookups, but if yours are then you may want to pull them out after you get everything hooked up. Use your best judgement for this and you’ll be just fine. The first thing I do is look at the power supply box. As you can see from the picture above, this campground has both 50 and 20-amp service. A lot of campgrounds, especially State Parks have 30-amp service. 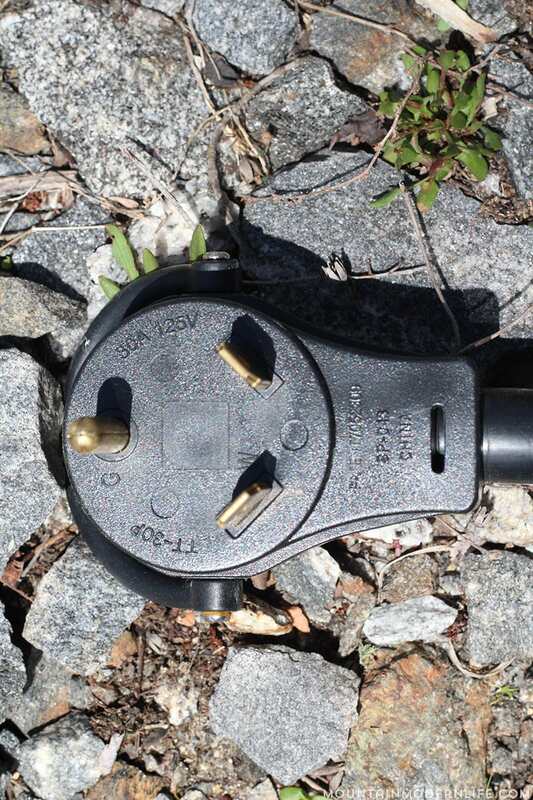 50-amp plug-ins have 3 flat prongs and 1 round prong. 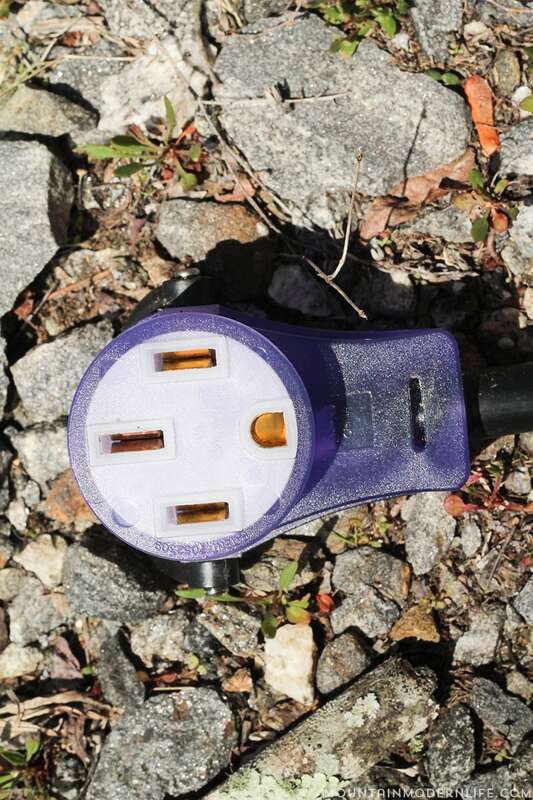 30-amp plug-ins have 2 flat angled prongs and 1 round prong. 20-amp plug-ins are your standard house plug-in with 2 straight flat prongs and 1 round prong. 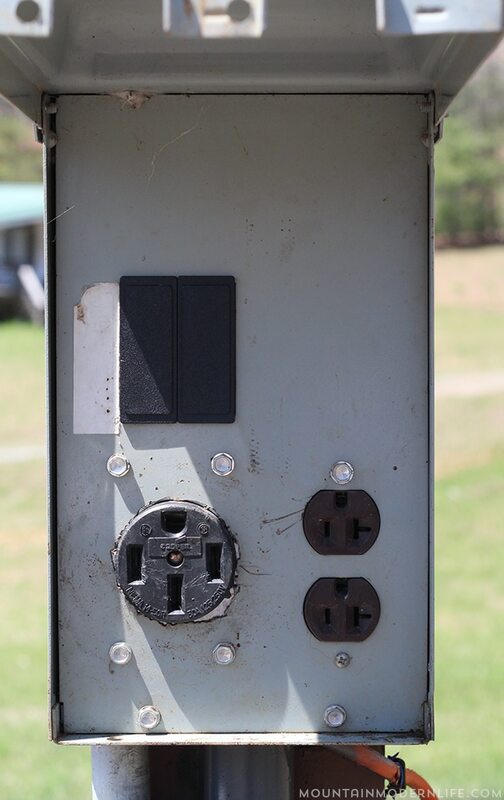 At this point you know which power you have and which power the campground has so it’s time to get connected using the correct plug-in. The first thing you’ll want to do is cut the power to the power supply box you’re going to be connecting to. 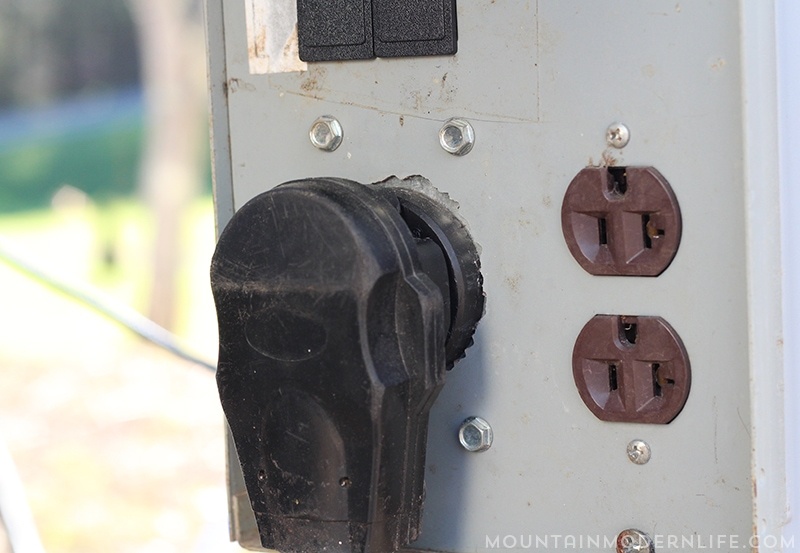 Most campgrounds have a breaker switch right in the box where you’ll be connecting. With the power turned off you can go ahead and plug your rig into the power supply. After making sure you have securely connected the plug you can flip the breaker switch back to the on position. 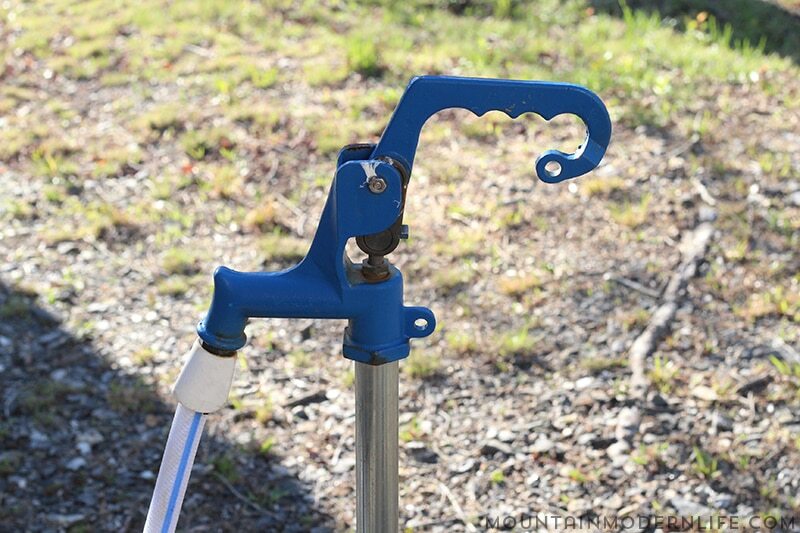 Now it’s time to get the water flowing through your rig. You’ll want to grab your fresh water drinking hose. 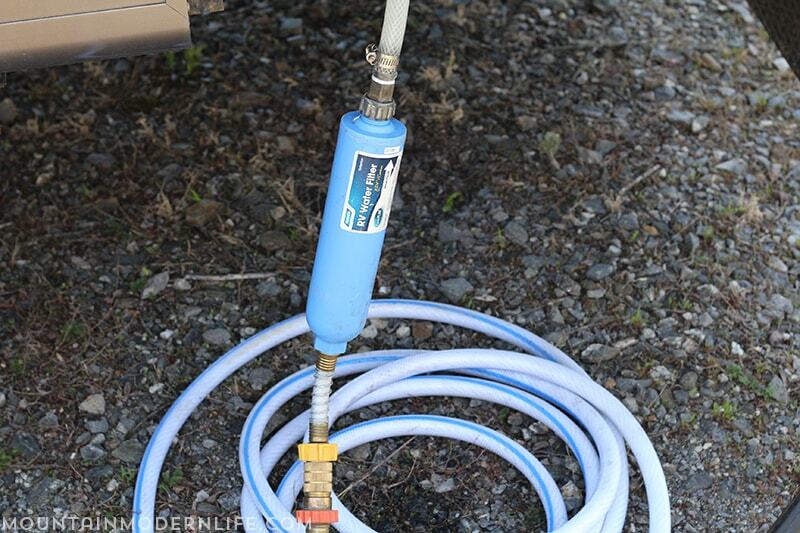 It’s important when hooking the water up to your RV that you make sure your hose specifies it’s for drinking water. Next you’ll want to grab your water pressure regulator. The main reason to use a water pressure regulator is to ensure the water isn’t coming into your system too fast, otherwise it can create problems for your system, which we don’t want. This is the one we use, though there are a ton of options out there. You’ll need to do a little research to decide which is best for you. The next piece you’ll need to grab is your water filter. While this isn’t mandatory, we’ve found it helps get rid of contaminates. Now you have all the pieces you’ll need to hook your water up. I’ve seen many different setups as far as where to plug up the water regulator and filter, so I recommend doing research to determine which way works best for you. Below are a couple photos showing how we connect our water. 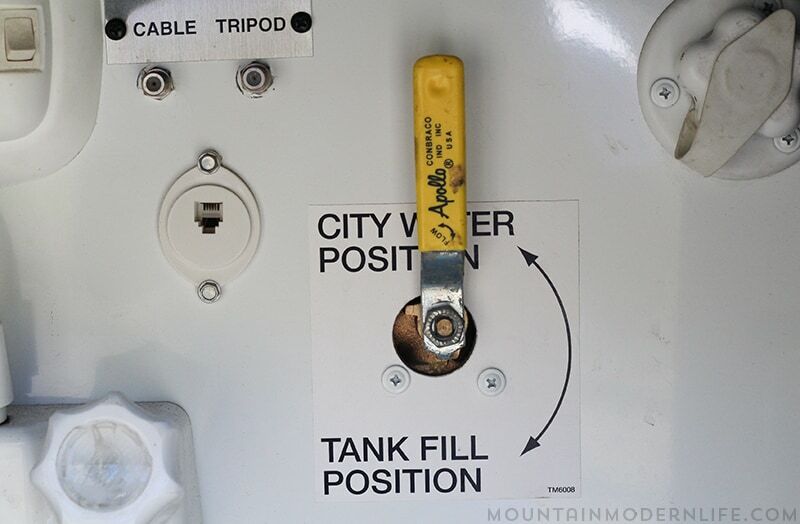 It’s important to make sure your water system is set to City Water and not your water tank, and that your water pump is turned off while you’re connected to City Water. Boom! You’re now connected to power and water. Cable hook up works the exact same as if you were connecting your cable box up at home. 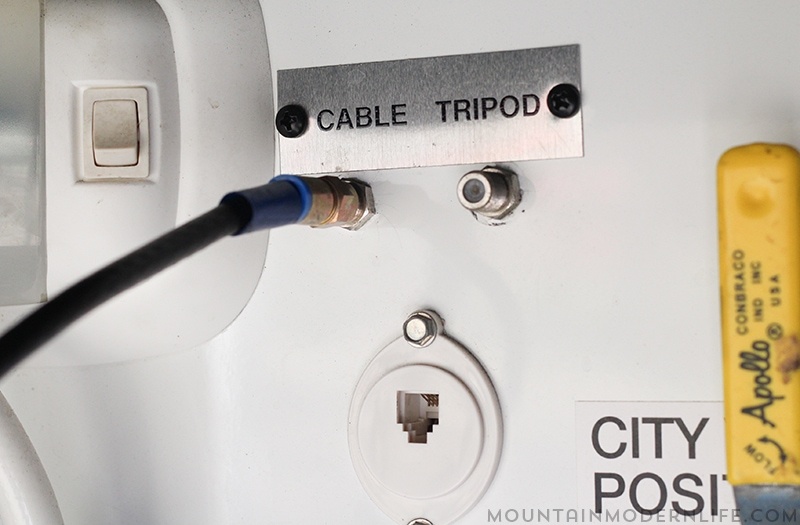 If your campground provides cable access you need to grab your coaxial cable and connect one end to the cable supply and the other into your rig. Now that we have cable, water, and electric hooked up it’s time to connect to sewer. 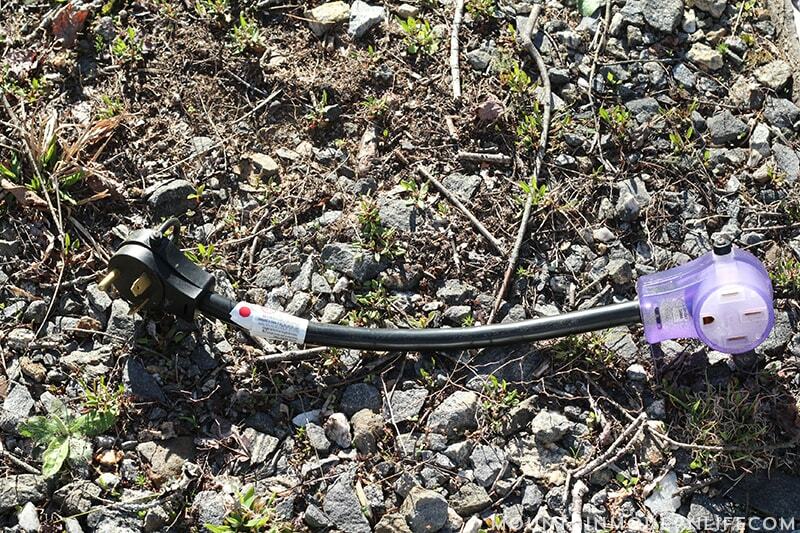 Provided the RV spot you’re staying at offers sewer connections, here’s how to get it connected. First things first, put on some gloves. I have a little box of disposable gloves I keep in the sewer compartment, though I’ve seen many people use gloves they can wash and reuse. I’ve never noticed any “contaminates” on my gloves, but it’s better to be safe than sorry. Now that you have gloves on it’s time to check your grey and black tank pulls to make sure they’re closed, then grab your sewer hose. 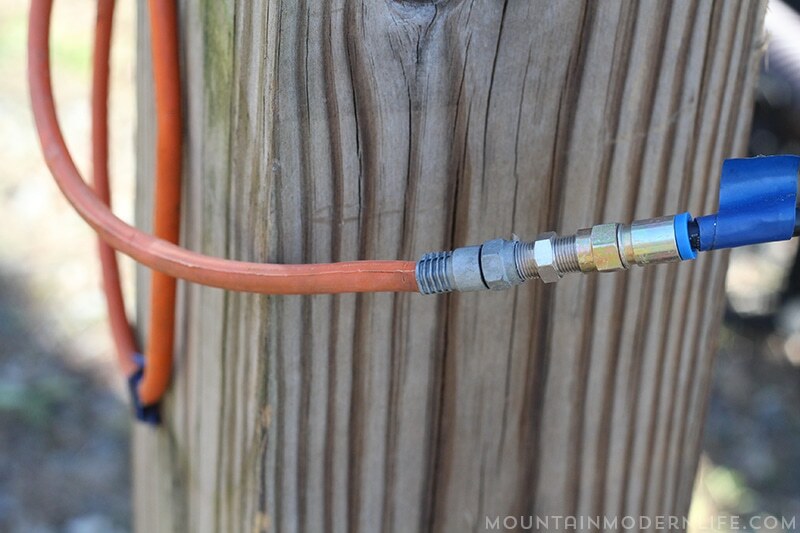 Using the open end of the hose with the twist-on connector attach it to your RV drain spout. 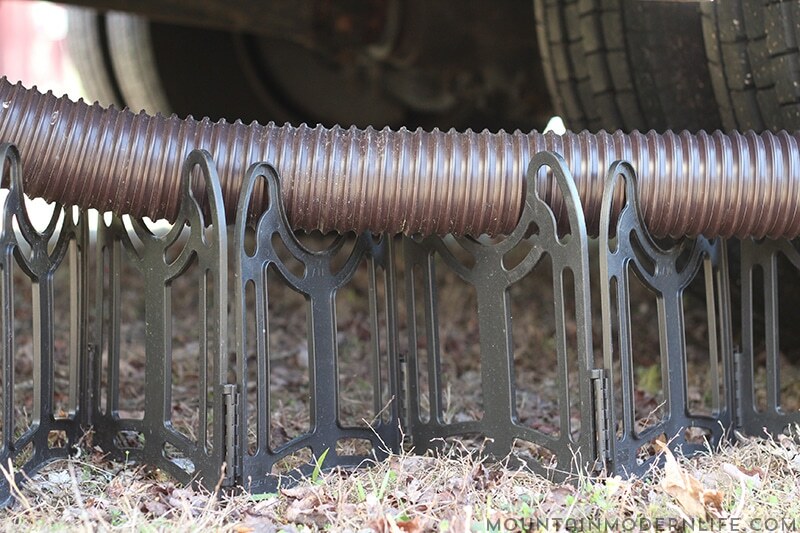 At this stage I like to grab my sewer hose support and run it from where I’ve attached the end of my hose to the RV all the way to the sewer drain. As I run the support I’ll place the hose in place. 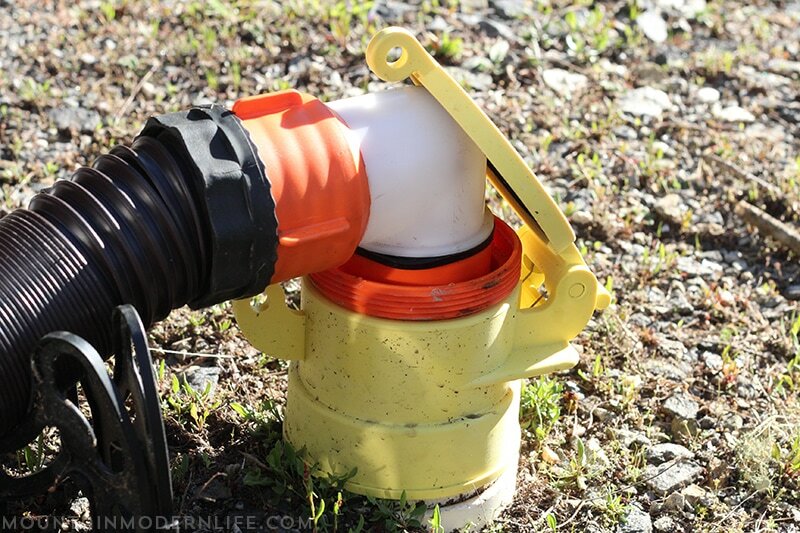 At the end of your hose you’ll need to attach your elbow that connects to the sewer drain then put it in place. If you look at the elbow above, you can see it sits well into the sewer drain. It actually has threads on it so you can generally screw it into position which ensures it doesn’t come flying out when you drain the tanks. 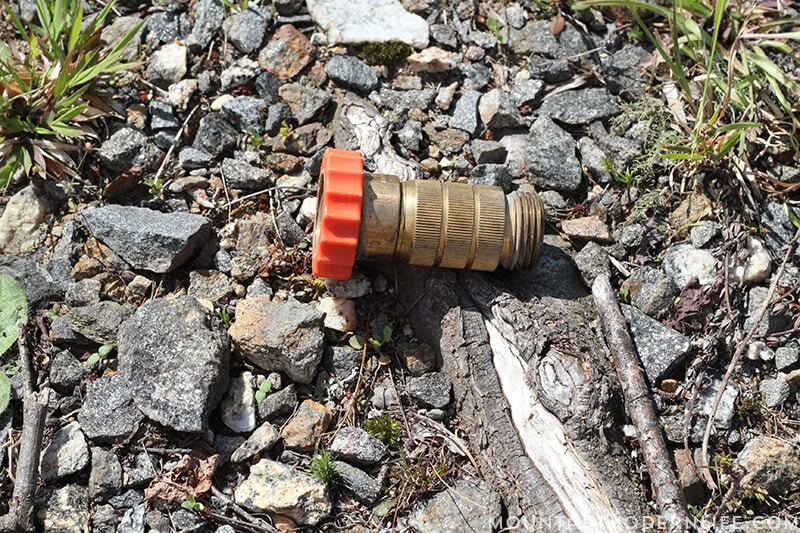 If the sewer drain has threads you’ll want to use them, some places don’t, so keep that in mind. As you go through this process a few times you’re going to learn approaches that you like and dislike. 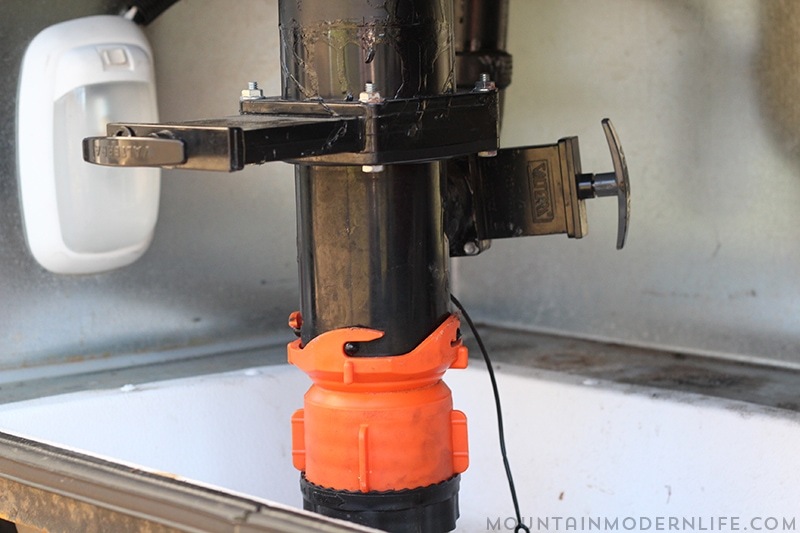 So roll with the punches, learn as you go, and remember your RV was made for fun so try to make the best of all aspects of RV life, including hooking up your sewer.